Te move gives Broadcom a larger share of the data center products market. Broadcom said on 17 November it has closed its acquisition of network gear maker, Brocade Communications Systems, giving it a larger share of the data center products market. Broadcom, which made a US$103 billion unsolicited bid for smartphone chip supplier, Qualcomm, earlier this month that was rejected, agreed to buy Brocade in November of last year. It won US antitrust approval for the deal in July. But in October, Brocade and Broadcom Limited withdrew and re-filed their joint voluntary notice to the Committee on Foreign Investment in the United States (CFIUS) to allow more time for review and discuss the proposed acquisition. Soon after that, Broadcom chief executive officer (CEO), Hock Tan, met US President, Donald Trump, and said the chipmaker will redomicile to the United States from Singapore. Broadcom shares were down 0.8 per cent at US$269.78 in early trade. Singapore-based Broadcom, formerly Avago Technologies, is trying to become the dominant chip supplier. It is known for its connectivity chips used in products ranging from mobiles to servers. 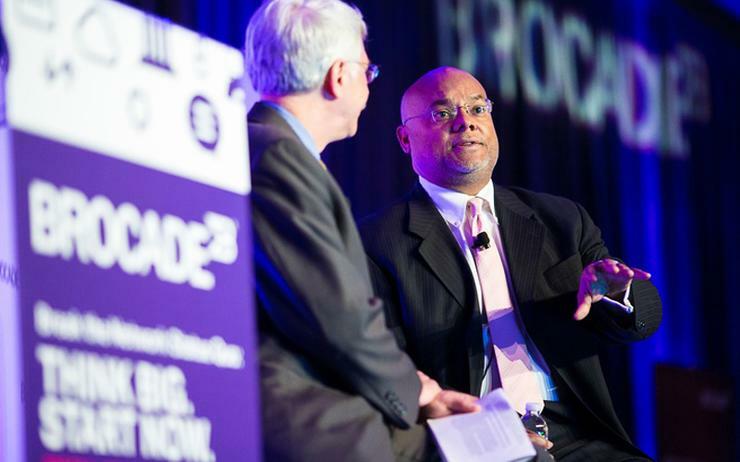 California-based Brocade makes networking switches, software and storage products. With this deal, Broadcom will grab more data center products market share by using Brocade's fiber channel switches that speed up data transfer between servers and storage devices. It will also help the chipmaker dig deeper into the connected devices and cars market. Brocade's common stock will stop trading on Nasdaq and the firm will operate as a unit of Broadcom, the company said in a statement.